Wagner's Prelude and Liebestod from Tristan provide the soundtrack for the images in today's post. Not played through loudspeakers; not played on my iPod; but played live by a top flight symphony orchestra. My photos were taken in the new Jernwood Kiln Studio at Snape during the week long residency by the Buddhist monks from the Tashi Lhunpo Monastery in India, and in the adjacent Britten Studio the Russian conductor Vasily Petrenko was rehearsing the Britten-Pears Orchestra in a programme of Mahler and Shostakovich as well as the Wagner. Predestination is clearly alive and well at Snape, because, as recounted in my recent article, Die Siegers (The Victors), was Wagner's planned but unwritten opera, which was to be based on a Buddhist legend. There is also, of course, a local connection; Britten's church parable Curlew River drew on a Buddhist meditation on the transience of life. 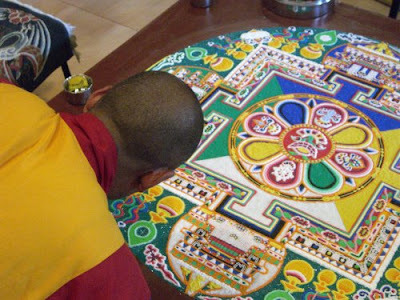 During their week's residency the monks of Tashi Lhunpo Monastery created a mandala in the Jernwood Kiln Studio. My photo above shows the marble dust being painstakingly applied through a metal funnel, and the lower photo shows the raw materials used. 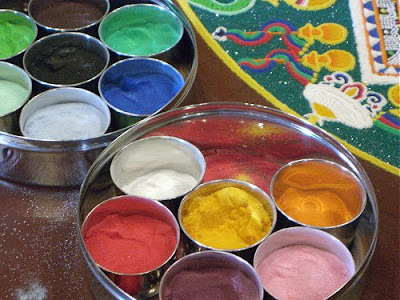 In Tibetan Tantric Buddhism mandalas are representations of the celestial mansion of the deities, and millions of grains of sand are used to create the elaborate design laid down in the Buddhist texts. When the final grain of sand is in place, the mandala is visualised as the residence of the enlightened beings. The Buddha remains within the mandala until the striking ceremony during which great thanks and appreciation are offered for his presence. The enlightened being is then respectfully asked to leave, and the sand is poured into running water so that each of the blessed grains of sand reaches as far as possible for the benefit of all sentient beings. Tomorrow (August 16) the mandala created at Snape is being swept into the River Alde. Eight hours later the young musicians of the Britten-Pears Orchestra will play the first bars of Wagner's Tristan Prelude. Both events, I am sure, will be for the benefit of all sentient beings. Tashi Lhunpo Monastery was founded in 1447 as part of the Gelugpa, or Yellow Hat Buddhist tradition. It is the seat of the Panchen Lama, the second most important spiritual leader of Tibet after his Holiness the Dalai Lama. During the Communist Chinese invasion of Tibet in 1959 and the Cultural Revolution from 1966-80 great damage was done to the monastery in Tibet, which at its peak was home to a community of 5000 monks. In 1972 Tashi Lhunpo Monastery was re-established in south India by 250 monks under the direction of the Dalai Lama. 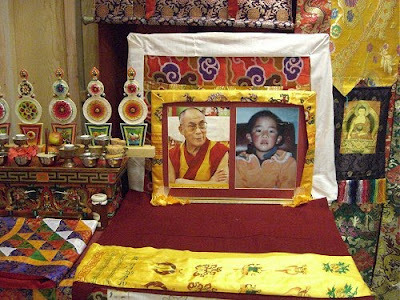 Following the sudden death of the 10th Reincarnation of the Panchen Lama, Godun Choecki Nyima, who was born in 1989 in the Tibet Autonomous Region, was recognised in 1995 by the Dalai Lama as the 11th Reincarnation, although this was disputed by the Chinese government. Immediately following his recognition the Panchen Lama and his family were taken from their home and their whereabouts remain unknown to this day. Human rights watchdogs believe the Panchen Lama may have been living under house arrest since 1995, and he has been named as the youngest political prisoner in the world. 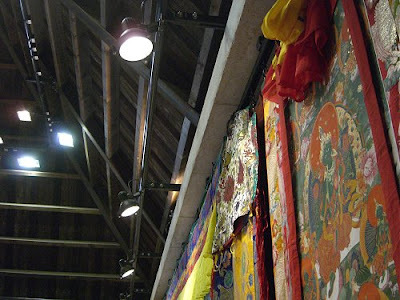 My photo below shows the shrine to the Panchen Lama and his Holiness the Dalai Lama created by the monks at Snape. While symphony orchestras, opera and ballet companies queue to practice 'cultural diplomacy' in China the monks of Tashi Lhunpo and their supporters continue to pray that the Panchen Lama has not suffered the same fate as the thousands of other Tibetans killed by the Chinese government. The National Symphony Orchestra of Washington D.C. is the most recent orchestra to tour China. In an article written in China Washington Post staff writer (and official WP blogger) Anne Midgette overlooked China's human rights record, but managed a juicy plug for the NSO's tour sponsor Dow Chemicals. Sadly there was not enough space for Ms. Midgette to provide some other background. Such as that Dow Chemicals was the sole supplier of napalm to the United States military during the Vietnam War, and also supplied the infamous Agent Orange, a chemical defoliant containing dioxin, as well as managing the Rocky Flats nuclear weapons production facility. But back to the music. My recent post When the sound really mattered attracted a lot of readers and comments. 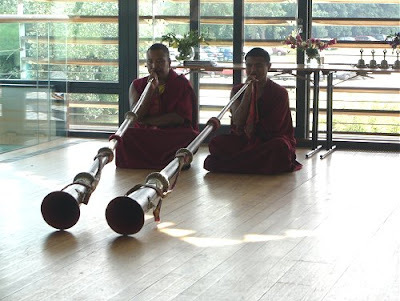 Anyone who still does not think the sound matters should have been in Snape Maltings concert hall on Thursday evening to hear the concert given by the Tashi Lhunpo Monks, and the sound of two Tibetan long horns (dungchen) ringing out in the Maltings famed acoustics. Take a look at the size of those instruments - that explains why the only loudspeakers that deliver decent bass are the BIG ones. I took the photo below during one of the excellent Tibetan culture workshops that ran through the week at Snape. All is not lost if you missed the Snape concert but want to find out whether your sound system can follow two Tibetan long horns down the scale. 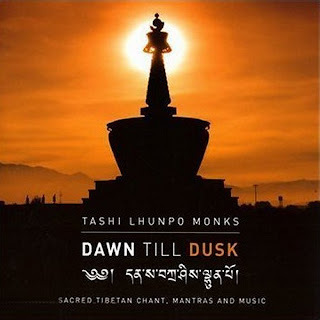 The Tashi Lhunpo Monks have recorded the CD of sacred Tibetan chant, mantras and music seen below. Wonderful sound is captured by a British recording team in the prayer hall of the monastery in India, and the beautifully presented disc is mastered in the UK. * Peggy Seeger (daughter of Ruth Crawford Seeger) sings Agent Orange on the Smithsonian Folkways CD Classic Protest Songs that featured in a recent post. Recommended to everyone connected with the National Symphony Orchestra. Tibetan secular music here and sacred chant here. Thanks for your informative blog! Personally, I've found incredible Tibetan singing bowls at http://www.Bodhisattva.com They've got a wonderful website with tons of really high quality photos, Mp3 sound samples, videos, history of the bowls, etc. They ship worldwide and offer a 30-day satisfaction or your money back guarantee. And they give a percent of their profits every year to the International Campaign for Tibet. Check it out! I only came across this blog entry today, but I had posted an article "Wagner and Buddhism, Tristan and Isolde" on my blog two days ago - what a coincidence. It might interest you to know that Wagner first played some chords of Tristan on piano in the Villa Wesnedonck in Zurich (where I live) and the Villa Wesendonck today is the home to the biggest collection of Tibetan Buddhist art in all of Europe.